The chicks are about 16 days old now. Although there is a size difference between the youngest chick and the three larger ones, the little one is not missing out on anything, especially if food is involved. Although he may get pushed by the larger birds, he is plucky and elbows his way back into the action when mom is handing out food. 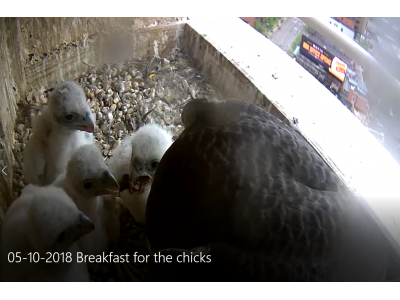 Watch the video clip from 05-10-2018 to see how these hungry chicks are keeping Rebecca busy. When it is warm, they spread out more in the box and sometime get under the camera where they can’t be seen. Are you an educator who is using the webcam in your classroom? We would like to know how you use the webcam in your lessons so please send us a message through the “contact us” button on the website.